South Florida Electronic Health Record firm to advance to the next step of US Government Certification. The Quantum Group, Inc announced today, that through its subsidiary, Quantum Innovations, Inc. (QI), it has submitted its healthcare technology platform, PWeR® 2.0 for MU2 Certification with a private IT security laboratory approved by the U.S. Government Agency regulating the industry. The platform has Meaningful Use 1 certification status (see below) and is supported in part by seven (7) approved and 15 pending patents. The accrediting organization has been authorized to perform complete EHR and/or EHR module testing and certification by an agency of the U.S. government, and is required to test and certify EHRs to the applicable certification criteria adopted by the U.S. Secretary under subpart C of Part 170 Part II and Part III as stipulated in the Standards and Certification Criteria Final Rule. Designed by The Quantum Group, and developed by Quantum Innovations, PWeR® is an intelligent healthcare technology platform hosted in the cloud (powered by Amazon) that combines a transformative EHR (electronic healthcare record) along with an expanded practice management system to include scheduling and billing components. It hosts medical records and permits the entire patient care team, including authorized primary care physicians, specialists and other healthcare organizations such as Management Services Organizations (MSOs) or Accountable Care Organizations (ACOs), to share access to a patient’s medical record in real-time, in a secure HIPAA environment. “This project continues to be the culmination of a 15 year personal passion for me,” Guillama further commented. With experience having received MU-1 compliance on December 31, 2013, The Quantum Group expects that it will be conducting testing of the platform over the next 120 days, and estimates approval before the end of 1st quarter of 2015. Quantum Innovations, Inc. is a subsidiary of The Quantum Group, Inc. and operates under a license from it to use the PWeR® trademarks, as well as numerous patents both issued and pending. Quantum Innovations seeks to provide technology solutions through PWeR 2.0, a 21st century healthcare technology platform and Meaningful Use certified EHR product. For further information, visit: http://www.quantuminnovations.com. 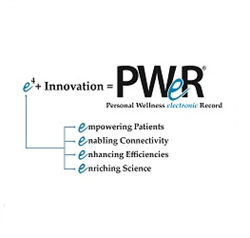 PWeR® stands for Personal Wellness electronic Record®. This 21st century technology solution is a new breed, intelligent healthcare information platform that hosts medical records and permits interactive use. Medical records follow the patient, giving every healthcare provider that sees a particular patient access to all the information needed to assist in their diagnosis and treatment plan. Providers are able to access a patient’s entire medical record in one glance. In critical situations or in providing treatment to patients on the PWeR 2.0 platform, providers will be enabled to access full medical histories and make educated treatment decisions based on accurate data .That’s PWeR – Complexity meets SimplicitySM. For more information, visit http://www.myPWeR.com. PWeR® is a Registered Trademark of The Quantum Group, Inc. and it assigns or licensed users, in the U.S., China, EU and other nationalities. This Complete EHR is 2011-Edition compliant and has been certified by an ONC-ACB in accordance with the applicable certification criteria adopted by the Secretary of Health and Human Services. This certification does not represent an endorsement by the U.S. Department of Health and Human Services or guarantee the receipt of incentive payments. Vendor Name: Quantum Innovations, Inc.
Grace Century FZ LLC is an International research and private equity consultancy located in Ras Al Khaimah (north of Dubai) in the United Arab Emirates (UAE). Grace Century specializes in “game-changing” life science and health related private equity projects. For more information, visit: http://gracecentury.com. Certain statements contained in this news release, which are not based on historical facts, are forward-looking statements as the term is defined in the Private Securities Litigation Reform Act of 1995, and are subject to substantial uncertainties and risks that may cause actual results to materially differ from projections. Forward-looking statements can be identified by the use of words such as “expects,” “plans,” “will,” “may,” “anticipates,” “believes,” “should,” “intends,” “estimates” and other words of similar meaning. These statements are subject to risks and uncertainties that cannot be predicted or quantified and, consequently, actual results may differ materially from those expressed or implied by these forward-looking statements. Such risk factors include, without limitation, the ability of the Company to properly execute its business model, to raise substantial and immediate additional capital to implement its business model, to attract and retain executive, management and operational personnel. The Company does not undertake any obligation to publicly update any forward-looking statements. As a result, investors should not place undue reliance on these forward-looking statements.